The February #STEMchat on girls in engineering was a huge hit. I’m delighted to present an overview of the conversation and the best links and resources that chat participants shared during our Introduce a Girl to Engineering chat. Thanks again to the National Engineers Week Foundation for sponsoring this great discussion and our fabulous panelists for keeping the conversation going! How do you bring up engineering in conversations with your girls? For some it’s easy to do this because their daughters like to learn how to make things. Everyday tasks like cooking and gardening, which use STEM makes it a natural conversation. Even tossing a ball up in the air is an excuse to talk about gravity. Find clubs and competitions! The National Engineers Week Foundation sponsors the popular Future City Competition. Start by showing her all things engineering has created and how those make the world a better place, as well as the people behind engineering -what are they doing to help people, not what things they’re building. Visit Engineer Your Life for great examples of how to engage girls in engineering and to expose them to great role models. Ask her how would she do something differently. Take advantage of local resources. One of our participants is lucky to live near The National Building Museum. Nurture their curiosity and interest in building things when they are young and keep it going. Hands-on learning is fun and memorable. What engineering activities and camps do your girls attend? Check out the Engineering Education Service Center’s database of summer camps. See The National Girls Collective Project program directory of programs nationwide. Science Explorers Camps are great! Check local community colleges or professional organizations like American Society of Civil Engineers. Tell your girls to check out the “video activities” at Discover Engineering. FutureCity encourages middle school kids to design and build a city of the future. Here’s a Kentucky STEM camp. I see so many girls get involved with the FIRST robotics competition program and report they feel powerful w/ power tools in their hands. My 8 year old loves Destination Imagination. Maker Faire, look for a Mini Maker Faire near you. Living in Washington, DC provides access to tons of great museums! Air & Space Museum, Maryland Science Museum, Port Discovery and the National Building Museum, one of our favorite family field trips! We have tons of options in Philadelphia for science museums, and our fave the Science Factory in Lancaster. Design Squad (PBS) has good project ideas and explanations. In fact, Deysi, one of the hosts, recently led a G+ hangout. Sci Girls (PBS) is great and the website offers activities to do at home. Project Scientist. Toys like Goldie Blox, littleBits, and Roominate that are fun for girls! Have you seen the Barbie LED dress? @LockheedMartin has free iPad app that explains how innovative technology works. What are ways you can encourage your girls to explore engineering at home or school? Parents should be willing to learn, too. STEM is all about exploration; don’t be afraid to try! Encourage your girls to experiment and discover STEM through home science experiments. I became interested in civil engineering when my grandpa and I built a scale model of my real house for my dolls! At school: Middle School girls (and teachers/school administrators about Future City and other STEM clubs. Make everything a problem solving endeavor- why does that work? How can you make it better? Encourage girls by presenting engineering as creating, inventing, solving problems. Host science and engineering night at the elementary school. Find resources and activities on the Introduce a Girl to Engineering Day website. Have Dine Arounds, teens have dinner at a professional women’s business and learn about careers, do hands-on activities. Build with toothpicks and marshmallows for yummy hands on fun! Why is it helpful to have a day focused on girls and engineering? Less than 10% of engineers are female. We owe it to our girls to show them that engineering is accessible to them! It’s important to have a day focused on Girls & Engineering to highlight girl power! This day gives girls a chance to connect with female professionals and students to see what it’s like. Show them engineering can be fun and girly! Girls need to SEE, HEAR & MEET women engineers so they know there are trailblazers out there. Girl Day is a great way to remind girls in engineering that we support them! We need more diversity in engineering. Different people = different ideas = better solutions, more innovation. 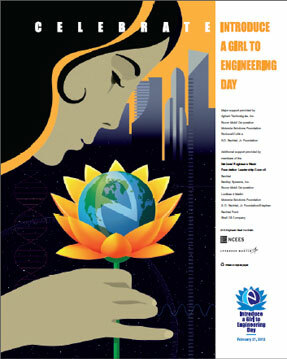 This day shows girls that engineering is awesome and nothing to be afraid of so it is very important. Girls used to learn that science and math were for boys, we need to do all we can to show them that’s not the case. One day can spark conversation, ideas and action that carry over to all days. What are your go-to sources for information on engineering topics that girls in your life might be curious about? For info on engineering concepts, check out @DesignSquad’s cool videos and activities, as well as their parent section. Many local Society of Women Engineers @SWEtalkand college chapters offer girl events during Engineers Week! Engineer Girl is a good guide for middle school girls. For info on different engineering fields, send them to Discover Engineering or Engineer Your Life, which is a great guide for high school girls. Make real world connections with Engineering Challenges. One of my favorite resources is the Family Engineering book. My husband! He’s a network engineer! Or my dad who’s architectural engineer. Or my brother who is a biomedical engineer! US Army Corps of Engineers, a great supporter of women engineers and the local communities! @EPAgov, the US Environmental Protection Agency, as a lot of resources related to how our Earth works. Sign up to be a @FabFem STEM role models at FabFems. Read up on girls and STEM in The Huffington Post. Go-To resources include TED Talks, MIT Open Courseware, Khan Academy, NASA also Women@NASA. One of my newest resources is Project EEME. What kind of skills and interests does one need to be an engineer? Scientists & engineers try to find out how things work, so curiosity is a must, so is a creative approach to solving problems. Problem-Solving: working on teams, problem-solving, making a difference in the world, improving processes, never stop questioning the world around you. Curiosity: resourcefulness, willingness to learn, creativity, imagination, problem-solving. Skills: communication skills, analytical abilities, persistence, math, science. Persistence: be willing to to try new ideas and don’t let others talk you out of them, believe in your dreams–and yourself! Hunger to Learn: engineering is everything – math, science, tech, reading, writing, history. You can have all kinds of interest and skills! There’s an engineering profession for almost *any* interest! Confidence: engineering is a male-dominated field; to succeed as a female, you must be confident in your abilities. Who were some of your engineering role models as a young girl (or now)? Sally Ride – this year’s Girl Day is dedicated to her memory. Dr. Sally Ride and Dr. Mae Jemison (a woman of color)were trail-blazers that I admired! Dr. Ellen Ochoa was the 1st Latina in space and is now head of the Johnson Space Center. Susan Niebur for the way she was always able to take complicated STEM & explain it to my kids. She also worked to create supportive environment for women at NASA. My dad working on everything he could take apart inspired me to go into engineering. BTW, he isn’t an engineer! Lots of good role models will talk about women & engineering at this year’s Engineering Global Marathon (a free online event). My mentor from my internship @EmilyTuzson she is a confident engineer who mentors aspiring, female engineers. What would you say to a girl who expresses an interest in a engineering career? I shared these response on last week’s STEM Girl Friday. How do we continue to change the conversation about females in STEM? Keep spreading the word – engineering is about making the world a better place for people. Effective messaging! Tell girls engineering is creative, team-oriented and makes a difference in the world. To make change happen, make it the norm for girls to be in engineering! Model STEM ourselves. Do our own STEM projects; at least have girls watch if the don’t want to participate. Challenge the stereotypes and gender biases. Encourage, support, mentor! If a school doesn’t foster STEM then take the steps to make it happen, so girls have a chance early in life. We can change the conversation by speaking up, encouraging girls, and celebrating STEM women! And as parents, we continue to foster the curiosity by wanting to learn too. Learning along with kids will motivate them! Best way to change the conversation about Women in STEM is to be part of it. Our voices count! Get and stay involved in outreach events and programs like National Engineers Week and local clubs. Share this inspiring video about getting girls excited about engineering! We must broadcast the need for more women in engineering & communicate positive messages to girls about STEM careers. The next #STEMchat is schedule for March 16. We’ll be talking abut the Earth’s freshwater resources and how STEM can help solve some of our pressing water issues in recognition of World Water Day. Sign up for a reminder.